Today was tourism on the American plan. From Street we headed to Glastonbury. 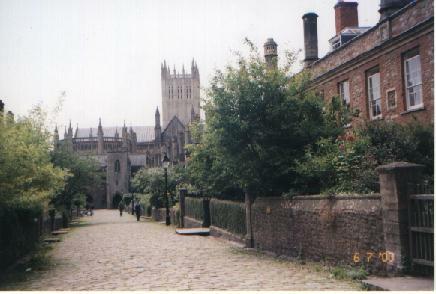 After touring the remains of Glastonbury Cathedral, we were back on the bikes and off for Wells. I convinced most of the group that a stop here to see Wells Cathedral was a good idea. I was right. It's an active and complete Cathedral, with Bishop's Palace, Chorister School, etc., etc. Fascinating. At least to me. After lunch in a nearby tea room, we were again on the bikes, headed now for the ancient city of Bath. 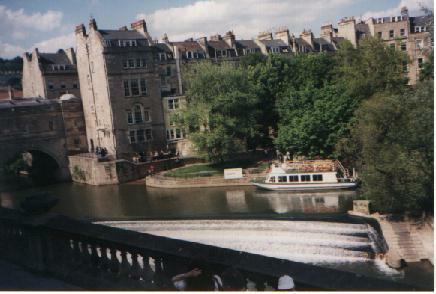 A few of us splurged for a city tour atop a double-decker bus, then we toured the old Roman baths. 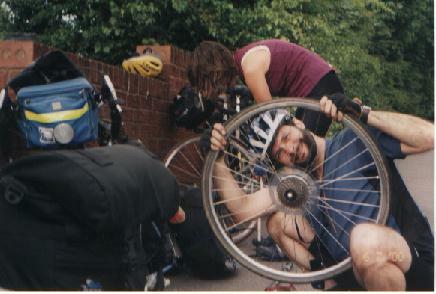 Finally, we mounted a rotating pace line along the Bath to Bristol bikeway to try to make it to the hostel by 7:30. We arrived about 7:35. Too late! Just now got back from a local pizza joint, and just finished showering and doing all the little chores that need doing every night. It occurs to me that I should probably give a little background on who we all are. There are seven of us. Five men. Two women. I knew a couple of the folks from previous bike tours, but most I met just a short time before the trip when we got together for an afternoon ride. So far, it's an easy going group and everyone has been getting along. Cycle touring has it's stressful moments though, so time will tell.